Timbre Abonnements à nouvelles émissions 2019 - Abonnements à Nouvelles émissions thème Gymnastique Neuf sans charnière - Freestampcatalogue.fr - Le catalogue de timbres en ligne gratuit avec plus de 500,000 timbres. 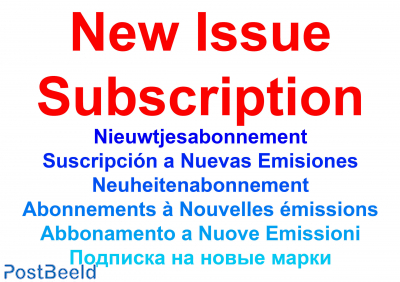 By adding a basic topic New Issue Subscription to your shopping basket you will be able to receive all* officially-issued new postage stamps and blocks (except for extreme countries**) if at least one stamp of the edition shows your topic. On request, the subscription can be extended by adding one or more of the following options:- stamp booklets, minisheets and automat stamps. You also have the option to only receive stamps from European countries. Or you only receive series or blocks of which at least 80% of the stamps show your topic. The prices we use for new stamps in subscription are those as stated on our website but with a 5% subscription discount. Delivery will take place up to 12 times per year, depending on the number of issues and subscriptions. You will receive an invoice and a payment request together with the stamps. ** A number of countries have a very extreme publishing policy (usually topic blocks with high nominal values that are hardly used in the relevant countries for postage). We do not deliver these countries in a basic topic subscription. On request, issues from these countries can be added to a subscription. These countries are Burundi, Comores, Congo Rep., Guinea-Bissau, Rep. Guinea, Ivory Coast, Mali, Mozambique, Niger, Saint Thomas, Solomon Islands, Togo and Uganda.